A Brooklyn day which started by walking across the Brooklyn bridge. We also did a walking tour through Brooklyn Heights. A short day, getting ready for the last couple days before we return to Seattle. Other than our trip to the Hudson River Valley, we've spent all our time in Manhattan. It was time to check out Celeste's borough, Brooklyn. 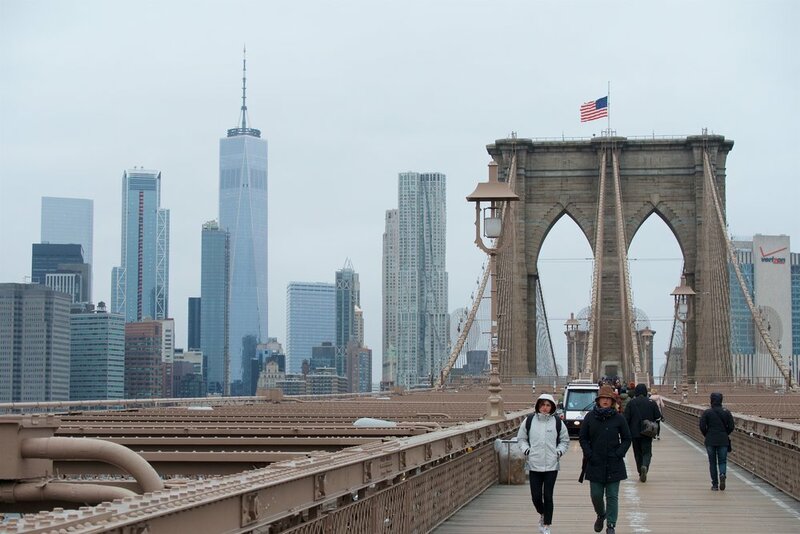 What better way to get there than by walking across the Brooklyn Bridge? We met Celeste on the Manhattan side of the bridge and started across. The previous couple days were in the 70s, but this day was in the low 40s. Of course, walking over the water involved a lot of wind and wind chill, which easily dropped the temperature into the 30s. Several people were walking across, as well as a few people on bikes. There is a lane for each, but with so many pedestrians, they often wandered into the bike lane. I've walked across the Golden Gate Bridge a couple times, and the Brooklyn Bridge has a different feel. The color is an obvious difference, but the way you walk across is a completely different experience. Instead of walkways right next to the traffic, there's a wide path along the middle of the bridge (a strip on the north side is for bikes, the rest for pedestrians), and past the approaches, the road is at a lower level. The Golden Gate Bridge approaches don't have nearly as much land around them, either. Once we finished crossing the bridge, we headed to Brooklyn Bridge Park to check out the views. There weren't very many people there to enjoy the views of the bridge and Downtown Manhattan with us. We were getting hungry, and I noticed that we had walked past Grimaldi's on the way to the park. Celeste said she had been there and that it was good pizza, but we decided to try Juliana's a couple doors down since the line was shorter. As it ends up, it was started by the same people who started Grimaldi's. There was a short line outside, but the group in front of us was pretty large. After a few minutes, the host came out, seated the party of two behind us, then asked if we would sit at the pizza bar; of course, we said yes, both to see pizzas being made and to get out of the cold. The two sizes were a 16” small and an 18” large. Not much difference between the two, and we were thinking it would be hard for the three of us to finish up a small. We placed the order anyway and started watching pizzas being made at a very fast pace. Eventually, the pizza which seemed to be ours was put into the coal-fired oven, and a few minutes later, out it came and onto the stand in front of us. It looked great and we dug in. As it ends up, the three of us we were able to finish all eight slices. The Margherita with mushrooms had a slight char on the bottom and very bubbly cheese. Needless to say, it tasted great and we were glad we went there for lunch. Well-fed, we went to find our walking tour. We saw lots of brownstones, some homes which used to be stables, and a skylight in the pavement which lets light into a tunnel between a couple buildings. We walked along an esplanade and among lots of streets named for fruits (there were some benches at an area named the Fruit Street Sitting Area). Having done that, we went back to Harlem and Celeste grabbed the train back to her place. We had planned on going back to the room before dinner so we could relax and try to get more online time in. After picking up our laptops, we went to the store to get enough breakfast food to last us the rest of the trip then went across the street to Starbucks, since their stores are a known quantity to us as far as wireless quality is concerned. Ends up that store only had a couple seats along a counter which were taken. We went a couple blocks (Avenue blocks, about ¼ mile each) over to another Starbucks, and that one didn't have a lot of seating but there were free tables. After we were done, we returned to the hostel to have some dinner. For dessert, we split a cookie that the woman at the hostel had left for us; it was huge, so it was plenty.